Skip February 7, 2019 FEATURE STORY, Slide No Comments on Is stocking over wild fish a good idea? 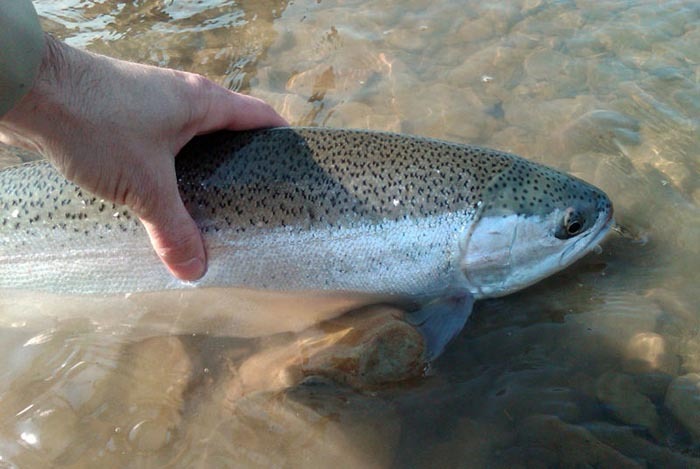 Lake Erie Steelhead (Oncorhynchus mykiss) in the Grand River in Ohio. Photo Zach Matthews, a commons image. Read more about Pete in DRAKE Magazine. When I first arrived in Washington, steelhead were ubiquitous. 150 rivers were open to recreational angling. In Puget Sound alone, wild, naturally produced steelhead probably numbered 200,000 or more. Instead of husbanding this precious resource, the state adopted management regimes that substituted domesticated hatchery steelhead for naturally produced fish and authorized unsustainable harvest fisheries. Sixty years later, what is left? Well, in word, nothing. Wild steelhead populations are on life-support and hatchery populations have collapsed. Despite spending hundreds of millions of dollars on hatchery programs, fewer and fewer hatchery steelhead return to our rivers with return rates hovering around 0.003 percent, of which about half are caught by recreational and tribal fishers. Would you invest in a business that took your $100 on the promise or returning 15 cents in two years? Yet, this is precisely the present situation with Puget Sound steelhead hatchery plans with taxpayers and sportsmen investing millions of dollars to get back a few hundred hatchery fish? Are there alternative approaches? How about trusting the fish themselves? There are many examples of wild fish recovering themselves if shielded from the pernicious and harmful impacts of hatchery plants and constrained harvest. Kamchatka, Russia, where in the three rivers (typically about the size of the Tolt River) where I work on in Russia, wild populations have soared from lows of 2,500 or so to about 10,000 in each river. Think of it: These three small Russian rivers produce more wild steelhead than all the rivers of Puget Sound combined! Similarly, wild steelhead populations in the Nisqually and Skagit have rebounded strongly with the discontinuation or drastic reduction in hatchery plants. Consider the reciprocal approach for Lake Washington-Cedar River sockeye. In the 1970s and 1980s wild, naturally produced sockeye numbered 300,000 to 700,000. To boost Lake Washington sockeye, we built a large hatchery and began releasing millions of sockeye. Now, wild and hatchery returns are typically about a quarter of former abundance based entirely on natural production. Nothing is more illustrative of the addiction to hatcheries than state Department of Fish and Wildlife foot-dragging to designate a wild steelhead gene bank for a northern Puget Sound river based upon abundance, life history diversity, spatial and temporal distribution, and likelihood of long-term persistence. No river in Puget Sound comes within light years of the Skagit of meeting these criteria. In spite of overwhelming support from the public and conservation organizations to designate the Skagit and WDFW’s own biological assessments, the state has refused to make that designation and stonewalled disclosure of what should be a transparent public process. The state and tribes even propose creating a new hatchery program there using wild brood stock. Never mind that proposed source of the brood stock is protected from directed “take” under the ESA and the complete lack of empirical evidence that such hatchery programs actually work. What is certain, any such hatchery program will face a dizzying array of administrative and legal challenges, is unlikely to survive these challenges and almost certainly will never be built. Oncorhynchus mykiss (Steelhead) at the Oregon Zoo. A commons image. This insistence on a hatchery program superimposed on the strongest run of wild steelhead in Puget Sound demonstrates the virulence of the hatchery virus. Why not test the notion that steelhead do best if left to their own reproductive devices? We have tried the hatchery-based model in all its forms — integrated, segregated, domesticated brood stock, wild brood stock, captive brood stock. The results speak for themselves: They don’t work. Let’s pick out the best of what’s left and test the hypothesis that wild populations do best when free from interactions with hatchery fish. There is no better place to start than the Skagit River. Pete Soverel, an Edmonds resident, is a steelhead and salmon conservation advocate. 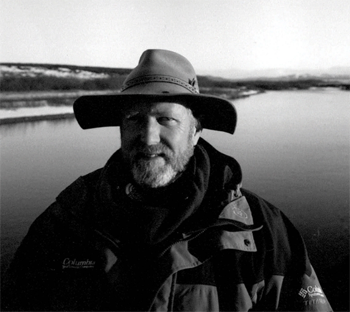 He founded The Wild Salmon Center and The Conservation Angler and co-directs with the Russian Academy of Sciences a long-term study of steelhead in Kamchatka, Russia.